Need to Bring a Stellar Side Dish To The Next Potluck? This Is One That Is Sure To Impress! Is it just me or is trying to come up with creative ways for my family to add more vegetables a chore. Seriously, I have grilled zucchini, sautéed carrots, and steamed broccoli, but this recipe takes creativity to a whole new level. The think I love about buying a cauliflower is that they really last a long time in the fridge. Even after they are cut up they are super hearty. You can eat them raw with a dip, or even riced as the base of a dish. Talk about functional! I love that this dish is actually more along the line of a loaded baked potato. 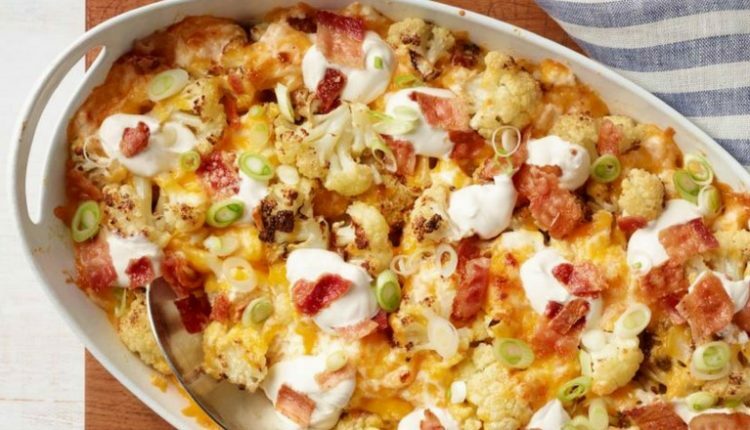 All the familiar flavors of your favorite stuffed spud are in this cheesy casserole that is low in carbs and high in flavor. The other day I say that the store I was shopping at started carrying multi colored cauliflower. There are shades of green and purples. Talk about a color splash. I think that it exactly the kind of thing kids would love trying. And adding bacon to the top is just flat out brilliant. I know my kids will eat just about anything that has bacon on it and chances are so will your family. So roll up your sleeves, pick up some of this versatile yet understated veggie and make something memorable. Quick Tip: This recipe makes quite a big dish, so for a smaller crowd, just cut the ingredients in half!